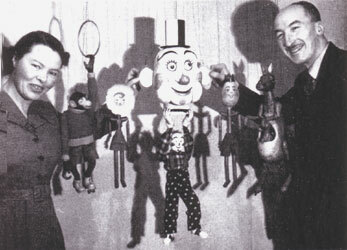 With his wife Maud and son Robin, Len Walker presented marionette performances under the names of The Rose-Berry Marionettes and The Merryman Marionettes. A Design Engineer by profession, Len was a brilliant technical illustrator whose illustrations adorned the pages of early issues of The Puppet Master - the Magazine of The British Puppet & Model Theatre Guild. 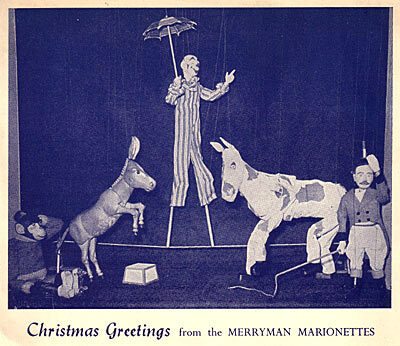 His illustrations also appear in The Marionettes of Barcelona - a book by Ray DaSilva on the work of Harry Tozer. 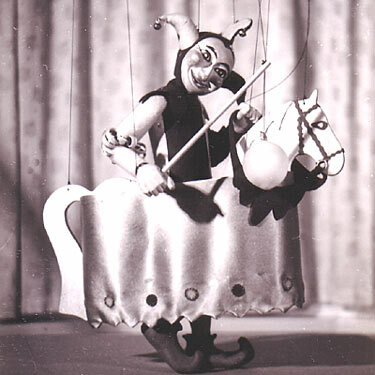 Len Walker's puppets and designs were a source of inspiration for many of the British Puppeteers who followed him. In addition to his puppetry skills, Len was also an accomplished poet and published a book of poetry - "A Light Hearted Look - Verses with Rhymes just like Old Times" in 1994, when he was 89 years old. The book was dedicated to the memory of his wife, Maud, who died in 1993. The following is the first verse of his poem "The Shrimp and the Crimp" which betrays the wonderful sense of fun which came across in all his work. Would look more attractive if I were to crimp it?"